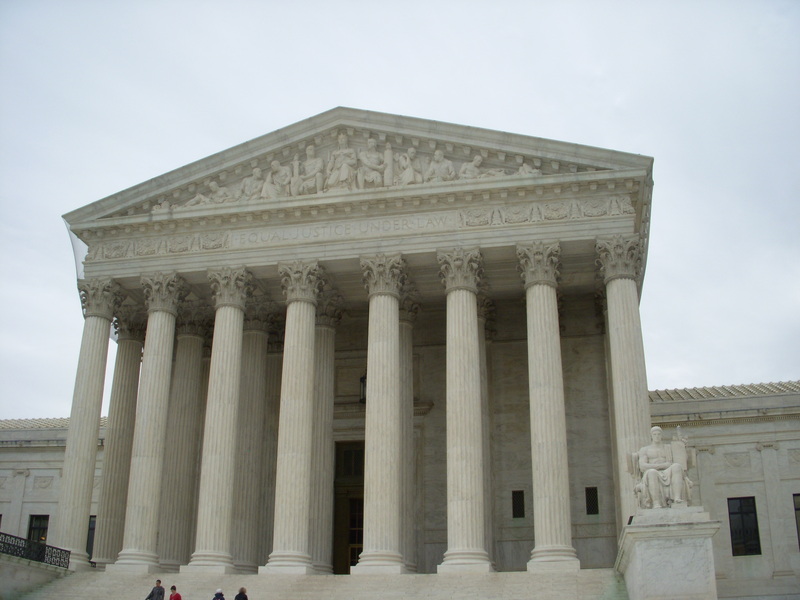 The Supreme Court of the United States rules that evidence of warrantless blood testing can be dismissed in cases based upon unreasonable search and seizure. Image Credit: “Supreme Court”. Licensed under Public domain via Wikimedia Commons. In July 2011, Coral Springs officer Peter Munoz was driving along LeJeune Road and Aledo Avenue in Coral Gables when his car crashed with Jennifer Gutierrez’s car. Guiterrez, 24-years-old, died as a result of the accident. As part of the investigation, Munoz’s blood-alcohol was determined to be .229, more than three times the limit of .08. He was charged with vehicular homicide and DUI manslaughter. Prosecutors alleged that in addition to Munoz’s high blood-alcohol level, he caused the accident by driving over the speed limit and striking Gutierrez’s car as she attempted to make a right turn. However, as it turns out, there was an issue with the blood-alcohol results. Under a Supreme Court of the United States ruling, cases of warrantless blood testing can be dismissed based upon unreasonable search and seizure. This was the instance in this case, which forced the judge to throw out that piece of evidence. Still, the manslaughter charges remained. On Wednesday, November 12, the parties attended a hearing on the case. In reviewing similar cases, the court rulings showed that Gutierrez’s driving was not considered reckless and the case was dismissed. It’s not unusual for technicalities to make or break a criminal defense case. Defendants have certain rights that must be protected. For example, in the instance of this case, the Supreme Court dictated in a previous ruling that when investigators can reasonably obtain a warrant before drawing a blood sample, they must do so under the Fourth Amendment. Miami.cbslocal.com, “Fmr. Coral Springs Cop Cleared In Vehicular Manslaughter Case,” 12 November 2014. Online Impersonation, Prank Calls on Steroids? Last month, two students from Fort Hood County in Texas were arrested on felony charges after they created a fake Facebook account for a fellow student. The two girls attend middle school and were charged based on the rumors, threats and vulgarities that were posted on the fake account, which had a photo of an individual who looked similar to the victim. The profile was active for about a month before it was discovered. With cyberbullying on the rise, Texas adopted a law in 2009 that makes online impersonation and harassment a felony punishable by up to ten years in prison. While I don’t condone harassment by any means, this brings to mind the old-school act of making crank calls; only now social media offers a potentially perfect storm for real damages and liability. At 63 years of age, and considerably past the age where I feel compelled to seek out adventure or thrills (thus minimizing the possibility of stupid behavior – for the most part) and having reached the point in my life where boredom is just another form of recreation, it would be easy to harshly judge teenagers who set up phony Facebook accounts and impersonate others. Certainly the damage caused by such activity can be harmful, and given the unlimited reach of the Internet, more extensive. However, as I stare at my four-year old grandchild while in the process of playing with my wife’s iPhone “Angry Birds” using her thumbs at a rate approaching the speed of light, it becomes obvious to me that the children of today can exploit social media as easily as we were able to make phony phone calls 50 years ago. Unquestionably, there are a few more steps involved, perhaps a bit more premeditation, but all-in-all, I tend to believe that in many instances the motivation may be at many times, akin to the driving force that had me at 12 year of age dialing a random number so as to ask a stranger at the other end of the phone “Is your refrigerator running?” and when the response was “Yes” declaring back, “Well don’t you think you oughta go catch it?” Oh well. Times were simpler then. It was a lot harder to hurt people or cause damage. Social media has certainly turned the phony phone call into a weapon of mass destruction.